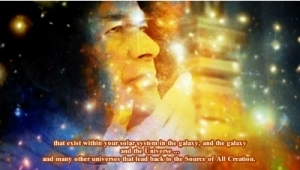 With great respect and love we are calling upon Cosmic Sai Baba to make his presence. We are at this time sitting in a room in Montignac, France (near Angoulême). And we welcome Cosmic Sai Baba’s presence amongst us. ❝I am here! And I am very pleased to be here … I have been waiting for this time for a long time. For it is something that is happening with John and Valerie in their visit to France, that they were welcomed with open arms and be at peace in the work that they do. But for the time being I am going to just give my regular message and say that I am very pleased that I have been called upon, and (I am very pleased) that a meeting has been arranged for I do love to have a few people around when I come. The girls in this room have been learning how to meditate. Now, meditation is a word that is sometimes misunderstood. And I would like to speak about that today. For it is not a religion, it is a way of communicating with the soul consciousness. And the soul consciousness is something that people have not readily realised (or a lot of people, that is) that it is a consciousness and it is able to give each person – each individual – each Earthling that has a soul – they are able to communicate with their soul consciousness and in doing so they are broadening the aspect of who they really are. And they can learn a lot more about who they really are. It is not difficult. It is quite easy. Because they have actually had the soul consciousness with them ever since they were first formed as a tiny little one. And that earth body … has grown from a baby to a child, and then an adult … and each time, the soul consciousness is adjusting to the growth of that being. There comes a time when they are an adult and able to make decisions for themselves – no longer depending on their parents. And from that point, then, they can make choices in their lives and carry forth the agreement they have come to Earth with, from the soul. The soul has an agreement of the many things they will be doing as their life progresses. They will be experiencing many things and meeting again with other souls that they know very well. Sometimes there are opportunities to heal misunderstandings between some of these souls. And other times there is great upliftment of joy and divine energies with those that they know very well and have come to assist them on their journey here on this Earth. For, they have an opportunity to – perhaps – do work together. It depends. It depends. I have not come to preach today. I just want to encourage people to meditate, and to feel that the knowledge I speak of is very real and it is possible for them to learn how to tune in to the inner person that they really are and move forward. It is a new frontier – it is a new frontier of knowledge and exploration that happens within the Self. For, answers exist from that place. And I would encourage people to explore that. And so I will not make this message today a long one; but it gives me pleasure – as I have said – to be here this day. And I thank you, I thank you, from the bottom of my heart for inviting me and organising this day. John and Valerie are going to be in France for another six months, and I want this to be known. So … I will send my blessing to everyone. Everyone that tunes in to me, I will assist. It is my pleasure to do so. And so, I take my leave and I give my blessing.